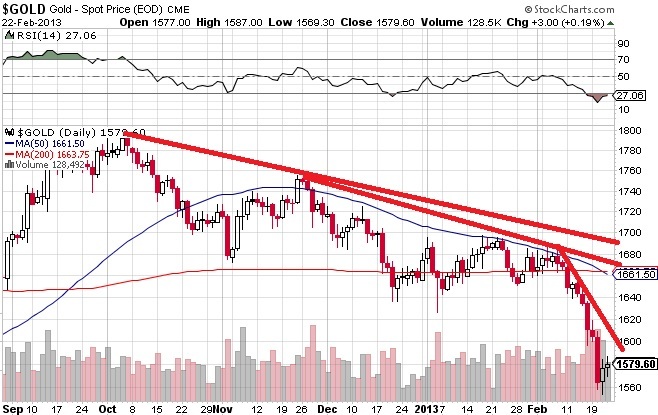 The price of gold is obviously far below the down-trend trend lines, so with just this chart as the basis for analysis, it would appear that gold is likely to continue it’s descent. From around $1,635 on Monday to below $1,555 on Thursday, that’s a 5% drop in four days. If gold continues to lose $80 per week gold will have no value by the end of July. 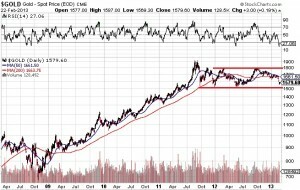 For some perspective, let’s examine the gold chart over the last five years. We see that in the depths of the October 2008 crash gold tested the $700 level. On Friday gold closed at $1,579.60, which is more than double the price less than five years ago. I don’t see how anyone can make the case that a commodity that has doubled in five years is someone in a death spiral. Yes, it is true that we did hit $1,900 in the summer of 2011, and yesterday’s closing price is 17% below that level, but again, a 17% pullback from the peak is not the end of the world. It’s what we anonymous blogging guys call a “healthy correction”. 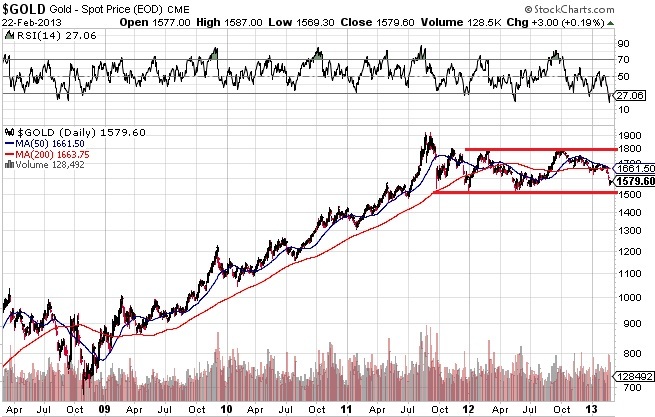 It’s obvious from the longer term chart that gold is has spent the last year and a half in a trading range between $1,500 and $1,800, so for the last year and a half the correct strategy has been to sell as gold approaches $1,800, and buy as gold approaches $1,500. So what should you be doing? Here’s a hint: gold closed Friday at $1,580, meaning it is approaching the lower end of the range. 1 Gold is cheap. See above. 2 Gold is cheap. See above chart. The Relative Strength Index is at 27, a level that in every previous instance over the last five years has marked an important turning point. In layman’s terms: once it gets this low, it can’t get much lower. 3 Nothing has changed. The government, all governments, keep printing money. That eventually leads to lower currency, and eventually prudent investors want to protect their assets by putting their funds in something that can’t be debased. That’s gold. So, this week, I averaged down. 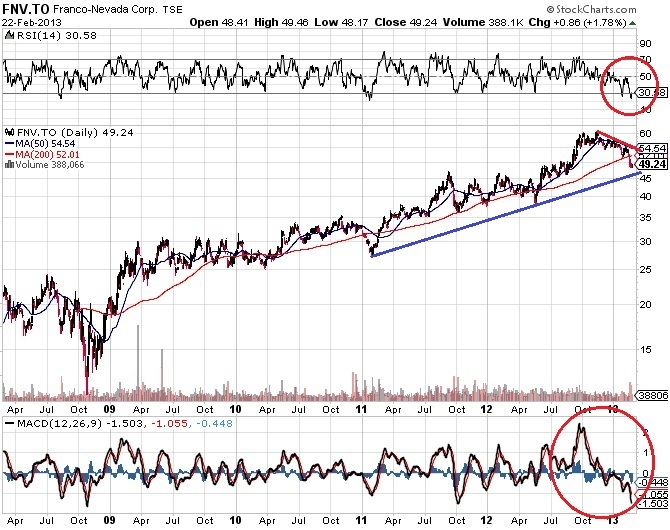 I bought FNV.TO – Franco-Nevada Corp. at under $50, which I expect I will look back on as a great deal. It was $60 last summer, and as the chart shows with a long term perspective this looks like a good buying opportunity. Yes, it can still go lower from here. I get that. But I’m not smart enough to try to pick the exact bottom, so on weak days I’ll keep adding to my position. This is a dividend paying stock, so even if it stays low, I’m generating more cash than I would if I put the cash in the bank. RGL.TO – Royal Gold Inc. I may be early. There may be further weakness ahead. That’s not the point. The question to ask yourself is this: If gold goes back to $1,900, or higher, will I be kicking myself for not taking advantage of these deals? Do I expect the government to keep printing money? I think the answers are obvious, which is why I’m taking advantage of the price weakness in gold.